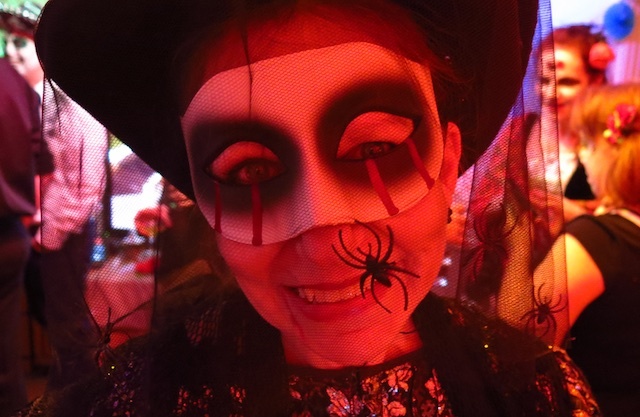 Dust off your scariest sartorial creations for The Mansion’s spine-tingling costume ball. Or, y’know, just leave your clothes covered in cobwebs; it’ll add to the ambiance. There will be a prize for the best outfit at this dance ‘til dawn of the dead party. Fire shows, fortune tellers, make-up artists and cage dancers should make for an eerily Instagrammable evening. The mystery location will be announced 48 hours before the event…but we can reveal that it is next to a cemetery in Northwest London. Missing it would be a grave error. (Ahem). October 27. 9 PM – 4 AM. More info here. For things that go bump (and grind) in the night, Bourne & Hollingsworth offers a tricky twist on Big Top entertainment. Their cabaret-style Dark Circus Party promises to be nothing less than “a world of heady illusion and unbridled visual delight…thrilling, provocative, and a little bit risqué.” Picture caged curiosities, sword swallowers, fire breathers, and treacherous trapeze acts. You’ve heard the “Elvis is Alive” rumours? Well, they’re half-right. 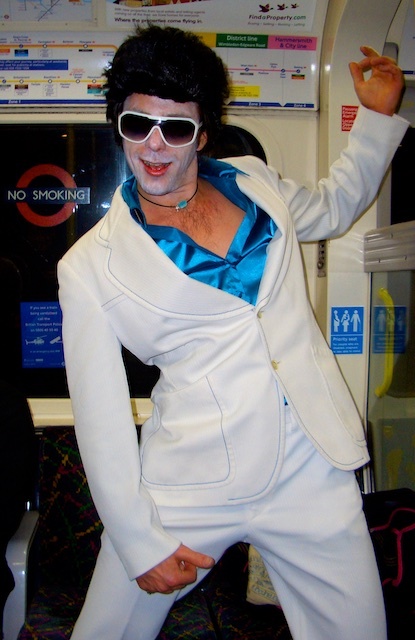 Zombie Elvis is currently not NOT alive and well(ish) on London’s Underground. Costumes are required. Per the website, “anyone wearing jeans, trainers or t-shirts will be refused entry and fed to the lions.” Don’t say you haven’t been warned. October 27. 9 PM – 3 AM. More info here. Delve into the realm of wizards and witches at the Warner Bros. Studio Tour London–The Making of Harry Potter, where you can immerse yourself in the enchanted universe brilliantly captured by the franchise’s eight films. Unlike The Wizarding World of Harry Potter in Florida, the UK tour doesn’t feature theme park rides. Rather, it encompasses two massive soundstages (J and K…get it?) filled with genuine sets, costumes, and props from the movies, which were largely shot next door. You can also read more about the Harry Potter experience here. 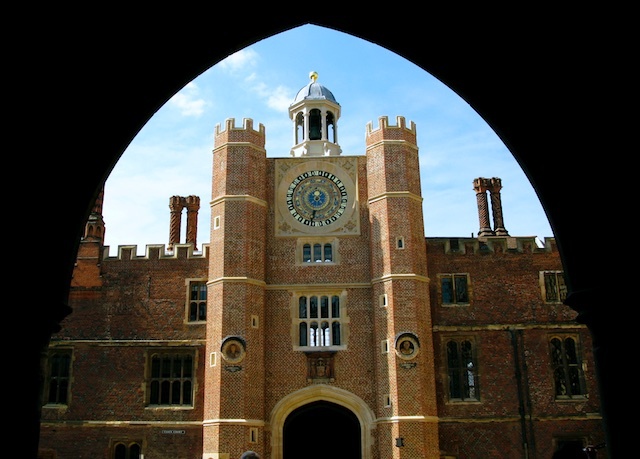 From the “Screaming Lady” (the screechy spirit of Catherine Howard, beheaded bride of Henry VIII) to Skeletor, a bony robed figure caught on CCTV, Hampton Court Palace claims its share of ghosts and ghouls. This autumn, the palace offers two ways to scare yourself senseless. Take a haunted tour—or even dare to spare an entire night slumbering in the King’s State Apartments. Just don’t expect your spectral spend-the-night party to include a king-sized bed. Oh no. The palace will provide communal sleeping arrangements, along with a mat and earplugs, to muffle the sounds of the snoring hoi-polloi peasantry sprawled alongside you. The royal treatment does, however, stretch to dinner, “live” (as opposed to undead?) entertainment, including characters in historical dress, plus a palace tour, and breakfast the next morning. Family and Adult haunted tours available on October 31, as well as additional dates in November and early 2019. Click here for dates and prices. Dusk ’til Dawn Sleepover November 3-4, 2018. Over 18s only. Details here. Hampton Court Station (a five minute walk from the palace) is 30 minutes by train from London Waterloo. More details here. 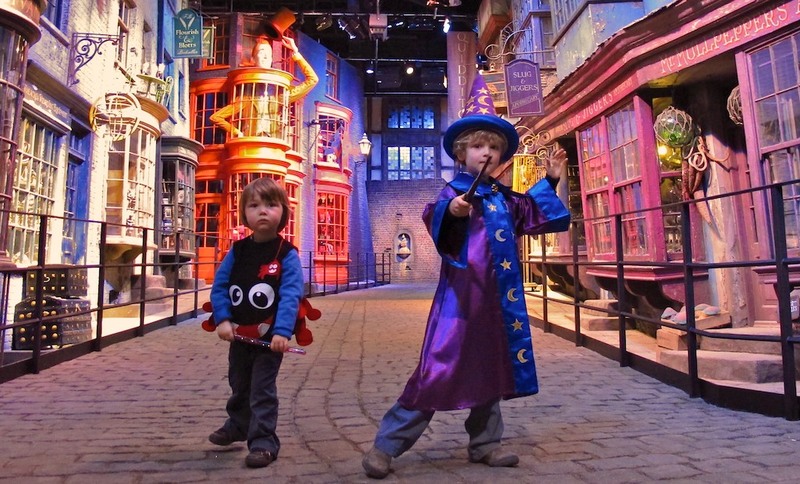 Where can Mummies take their little monsters for a special treat this October? 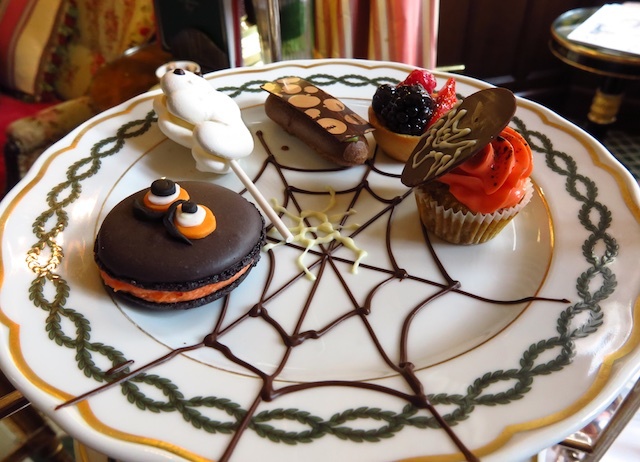 Halloween tea at the five-star The Milestone Hotel. Sit down to an array of devilish delights conjured by culinary sorceress Chloe Hemery, The Milestone’s Head Pastry Chef. Gorge on French confectionaries, freshly baked scones served with clotted cream and blood-red jam, and delicate finger sandwiches. (No, they’re not made from real fingers; sorry to disappoint). 27 October – 2 November. More details here. What’s even scarier than zombies and demons and werewolves (oh my)? BELL BOTTOMS. By which I mean “extreme flares,” not Kim Kardashian’s cartoonishly curved assets, as it were. That’s right, folks. Just when you thought it was safe to go back on the dance floor, along comes the Rivoli to prove that disco isn’t dead. It’s UN-dead. 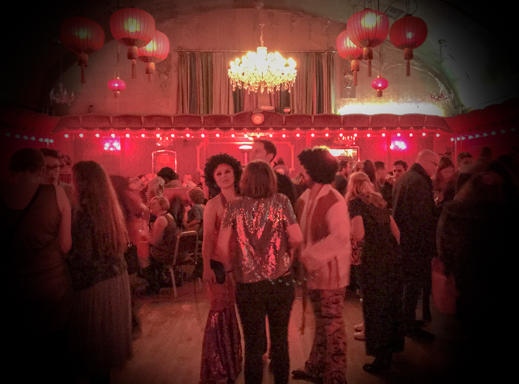 The 1950s-era ballroom, with its barrel-vaulted ceiling, crystal chandeliers, and sprung maple dance floor, is hosting a Halloween Disco and Funk Night with DJ Kobayashi and The Kick Thrills. If you need a tune to get you into a suitably terr(or)ific mood, check out Michael Jackson’s classic “Thriller” video. There’s your costume inspiration sorted, too. (You’re welcome). 27 October. Buy tickets here. 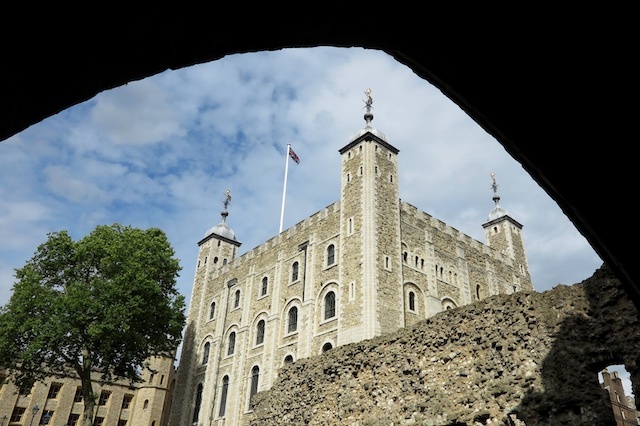 For a limited time, you can take advantage of exclusive, after-hours access to the Tower of London, where the ghost of Henry VIII’s beheaded Queen Anne Boleyn is said to share the castle walls with a cadre of cadaverous cronies. On Sunday nights, from November 18 – December, 2018 and January 6 – April 14, 2019, Yeoman Warders (that’s “Beefeaters,” to you and me) will lead these spine-tingling tours, taking in sites like Traitor’s Gate, the scaffold where countless unfortunates met their fate, and the Bloody Tower. So, who’s up for some haunted history? Hey, you wouldn’t have to “axe” me twice (ahem). Over 12-years only. More info here. 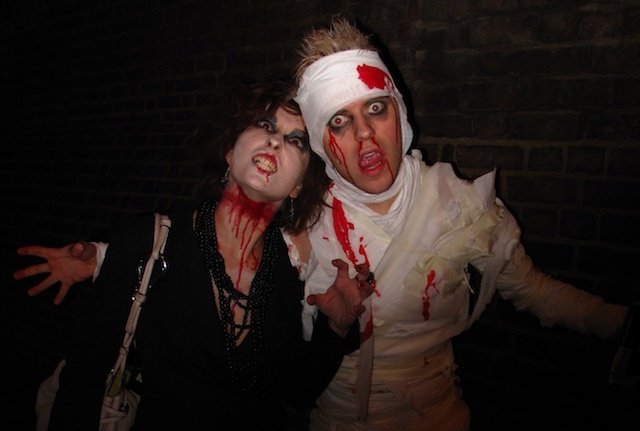 If you’ve got the appetite for more gruesomely great ideas, check out VisitLondon’s list of Halloween Happenings and their list of 13 Spook-Tacular Ways to Enjoy London anytime of year. But you don’t have to limit yourself to London. For more terrifying tours, here’s a story about my adventures in the most haunted cities in England. Always check to make sure the lid is on the ketchup bottle before you shake it.